There are as many versions of the story of Kinkō as one can imagine. So don't settle on one as being the absolute truth. In one of them Kinkō (Qingao 琴高 in Chinese in one of its many variant, transliterated spellings) goes into a river to bathe. A fish offers to give him a ride to a magical place. He accepts and is gone for some time. When he returns he asks his disciples never to eat fish again. Then he climbs onto the back of a giant red carp and disappears into the water depths forever. The text of the book he is holding in this print may have the printed request that men refrain from eating fish from then on. "The sennin Shiei (Chin. Tzū Ying) once caught a beautiful red carp. He set it free in his pond so as to be able to admire it at his leisure. He fed it well and it grew enormously. After a year its length was over 10 feet and it had grown horns and wings. One day Shiei knelt down and paid homage to his carp. It promised to take him to heaven. It started to rain, a typical association with the nature of dragons and Shiei sat himself astride his fish that carried him to heaven. The sennin Kinkō (Chin. Ch'in Kao, 12th cent.) spent a great part of his life drawing fishes and singing sacred songs. One day as he took a bath in the river, the king of the fishes invited him to his domain. Kinkō accepted the invitation. He told his pupils of his intention, naming a day for his return. Then he dived into the stream. On the day mentioned by Kinkō his pupils assembled on the bank. Astride a giant carp Kinkō emerged from the waves. After this he stayed yet a While with his pupils who took a vow never again to kill fish. Then Kinkō, and now for ever, disappeared into the stream." Quoted from: The Animal in Far Eastern Art: And Especially in the Art of the Japanese Netzsuke, with References to Chinese Origins, Traditions, Legends, and Art by T. Volker, pp. 24-25. There is a surimono by Hokkei of Kinkō riding a fish. It is in the collection of the Spencer Museum at the University of Kansas. Below is information taken from their online text describing that print. "Qingao was an imperial advisor of King Kang of Song (328-280 BCE) and Daoist immortal who lived in the Warring States Period of China. According to Liexian zhuan (The Series of Biographies of Immortals, or Ressenden [列仙伝] in Japanese), which was translated into Japanese and published during the Edo period, Qingao excelled at playing the qin (琴, Chinese zither) and at painting. One day he mastered the art of immortality. After having traveled around the Hebei area for about two hundred years, he rode a dragon into the Zhuo River, promising his disciples that he would return. He eventually reappeared on the back of a red carp coming out of the water. After staying for a month with humans, he again vanished into the water." Speaking further about the Hokkei print in Kansas: "Along with the issue of longevity, this surimono also reflects the fundamental wishes for worldly success. 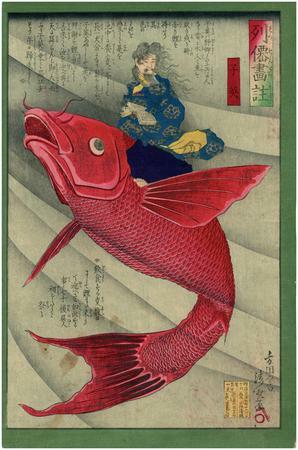 The carp has traditionally been considered an emblem of scholarly and official achievement in China and Japan. Chinese legends say that when a carp leaps the rapids at the Dragon Gate of the Yellow River it can become thereafter a dragon. This feat is compared to that of a scholar who attains academic success. Namely, the perseverance of the carp indicates the endeavors required to become successful in academic fields and public offices. In Japan, the carp’s symbolism is extended to general good fortune."